Climate change will have impacts on freshwaters through changes in hydrology e.g. through more frequent floods, but mainly through increased temperatures. Water temperature is a main determinant of water quality (such as oxygen concentration) and an increase will lead to chain of events that may affect community composition. In cold ecoregions, for example, extension of the ice-free period and increased water temperature will lead to enhance primary production and eutrophication, desynchronise life cycles and cause physiological problems for cold-adapted species. Cold-water stenothermic species which inhabit alpine stream environments for example are especially vulnerable to warming and snow loss (Brown et al. 2007). In, warmer regions, such as the Mediterranean, normal interannual variations are expected to be more extreme and this together with elevated temperatures and salinities would result in more frequent harsh conditions to the local biota. In central European regions temperature raise is predicted to lead to the extinction of sensitive species, such as several aquatic insects (Stoneflies) and fishes such as the European bullhead (Cottus gobio) (Logez et al., 2012). The spreading of invasive or alien species is also expected to occur in a more rapid way as habitats will become more suitable for invasion and establishment. This section presents examples of species that according to current scientific literature may be positivly or negativaly affected by climate change (“winners” or “losers”). For each ecosystem type (rivers, lakes and wetlands) and ecoregion (cold, temperate and warm) and different organism groups (phytoplankton/macrophytes, macroinvertebrates and fish) are presented. Expansion of this southern species to northern regions corresponded with the increase of temperature, even if it is still unclear which factor(s) is (are) the dominating one(s) (e.g. maximum temperature, mean temperature, duration of sunshine). Ott J. (2010). Dragonflies and limatic change - recent trends in Germany and Europe. BioRisk 5: 253-286. Restricted to high-mountain areas in the Mediterranean, mainly small streams and glacial lakes, that will disappear or be altered with temperature increase. Araujo, R. (2006): Pisidium hibernicum Westerlund, 1894. In: Verdo and Galante (eds. ): Libro Rojo de los Invertebrados de Espana. Direccion General para la Biodiversidad, Ministerio de Medio Ambiente, Madrid. It's a southern European species which occurs only in Iberia, Southern France and Italy where its preferred habitat consists of slow-flowing rivers and streams with trees growing right on the water's edge. Expansion of this southern species to northern regions corresponded with the increase of temperature, even if it is still unclear which factor(s) is (are) the dominating one(s) (e.g. maximum temperature, mean temperature, duration of sunshine). The Arctic charr Salvelinus alpinus (L.) is a holarctic salmonid with the most northerly distribution of any freshwater fish. The fish are regarded as one of the most cold- adapted of all salmonids: they continue to feed and grow at temperatures as low as 0.3anddeg;C and preferred temperatures are low (c. 12anddeg;C ), even compared with other salmonids. Arctic char is sensitive to water pollution and prefers cold, well oxygenated waters (temperature range 4-16anddeg;C). Lethal temperatures for juvenile S. alpinus are in around 23anddeg;C. Arctic char is sensitive to water pollution and prefers cold, well oxygenated waters (temperature range 4-16anddeg;C). 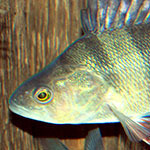 Non-migratory populations stay in lakes and rivers all year round. Charr may be first affected in shallow lakes owing to the absence of a cold-water hypolimnion refuge and within deep lakes, the effect will be first in eutrophic lakes where oxygen levels in the hypolimnion are low, but later in the warming process also in oligotrophic lakes. Fish such as Arctic cisco (Coregonus autumnalis), are examples of Arctic Guild species. The pervasive and ultimate impacts of climate change upon such species are likely to be negative. These impacts generally will appear as range contractions northwards driven by thermal warming that exceeds preferences or tolerances; related habitat changes; and/or increased competition, predation, or disease resulting from southern taxa extending their range northwards, possibly preceded by local reductions in growth, productivity, and perhaps abundance. Many of these effects will possibly be driven or exacerbated by shifts in the life history of some species (e.g., from anadromy to freshwater only). Other than conceptual summaries, no detailed research has been conducted to outline such impacts for most fish species of this guild. Reist J.D., Wrona F.J., Prowse T.D., Power M., Dempson J.B., Beamish R.J., et al. (2006) General effects of climate change on Arctic fishes and fish populations. Ambio 35, 370-80. Its populations are affected by an increased temperatures due to its ecological requirements. Due to its role as predator and its typical association with the brown trout its disappearance would affect the food web. Doadrio, I. (ed.) (2001): Atlas y Libro Rojo de los Peces Continentales de Espana. Direccion General de Conservacion de la Naturaleza. Ministerio de Medio Ambiente. Consejo Superior de Investigaciones Cientaficas. Madrid: 167-169. The broad whitefish (Coregonus nasus) is likely to be negativly affected by climate change. These impacts generally will appear as range contractions northwards driven by thermal warming that exceeds preferences or tolerances; related habitat changes; and/or increased competition, predation, or disease resulting from southern taxa extending their range northwards, possibly preceded by local reductions in growth, productivity, and perhaps abundance. Many of these effects will possibly be driven or exacerbated by shifts in the life history of some species (e.g., from anadromy to freshwater only). Other than conceptual summaries, no detailed research has been conducted to outline such impacts for most fish species of this guild. 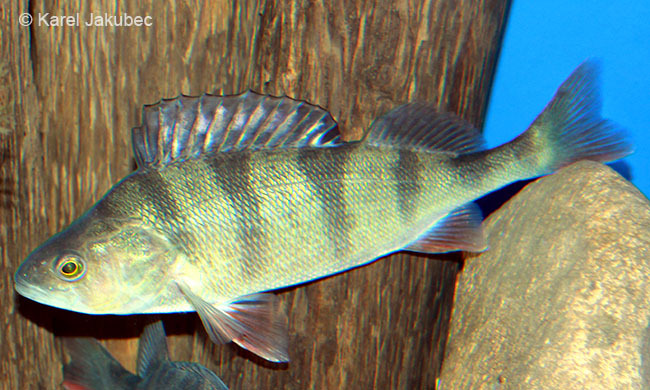 The perch Perca fluviatilis L. is a temperate mesotherm common in lakes, ponds and slow-flowing rivers across most of Europe and Asia. Perca fluviatilis are carnivorous and undergo a well-described dietary ontogenetic shift from zooplankton, macroinvertebrates to piscivory. Daily ration was maximal at 26anddeg;C , which is relatively close to the optimal temperature for growth. Under climate warming, an expansion in the distribution of P. fluviatilis is forecasted because of increased scope for growth and reduced overwintering mortality . Assuming that other factors (e.g. parasites, predators, availability of food, dissolved oxygen or the abundance of competitors) do not act as checks, P. fluviatilis growth, recruitment and survival is likely to improve in lakes and rivers where it is currently temperature limited. Increased growth will also result in greater individual fecundity. Graham C.T. and Harrod C. (2009) Implications of climate change for the fishes of the British Isles. Journal of fish biology 74, 1143-205. The salmonids are coldwater species with high oxygen demands, and the expected rise in temperature may extirpate populations, especially at the southern end of their distribution range where small populations face the greatest risk. Lake trout occur in lakes below the thermocline in southern deep lakes and a variety of cold lake habitats in the north. With an increase in temperature trout will restricted to smaller volumes of lakes and will need to enter these regions earlier in the year. Oxygen content in the deep zones will be affected by prolonged summer stratification, decreasing the habitat quality for lake trouts. Jonsson B. and Jonsson N. (2009) A review of the likely effects of climate change on anadromous Atlantic salmon Salmo salar and brown trout Salmo trutta, with particular reference to water temperature and flow. Journal of fish biology 75, 2381-447. The vendace is a coregonid fish species, which prefers cool and well-oxygenated water and hence its natural range is found in northern Europe. In the United Kingdom, the species is protected under the Wildlife and Countryside Act of 1981 and is a priority species under the U.K. Biodiversity Action Plan. The vendace is not just under threat in the United Kingdom and populations across Europe have shown recent declines. The predicted increase in water temperature of >2anddeg;C will cause thermal stress that could be leading to long periods with no suitable vendace habitat. Given that U.K. populations of this northerly species are already at the extreme southern edge of the geographical range, it is not surprising that a mean increase in water temperature of 2anddeg;C could see this species become extinct. ELLIOTT J.A. and BELL V.A. (2011) Predicting the potential long-term influence of climate change on vendace (Coregonus albula) habitat in Bassenthwaite Lake, U.K. Freshwater Biology 56, 395-405. © 2019 University of Duisburg-Essen | Faculty of Biology, Aquatic Ecology, All rights reserved.